We care deeply about your pets. Top-notch patient care and great customer service are priorities at Trinity Pet Hospital, which has long served the Orange County communities of Irvine, Laguna Hills, Laguna Nigel, Mission Viejo and San Clemente. At Trinity, we create a friendly, welcoming environment for all. It is our purpose to offer the best, kindest, most helpful care for pets at affordable fees. Another one of our goals is to make education available to you about what is best for your pet's health. A third aspect of our mission is to stay up to date on the most current, effective techniques for treating pets. Our veterinarian, Dr. Kerolos, and our Trinity staff believe in creating a friendly, welcoming environment to put pets and owners at ease. Another important aspect of our beliefs is to provide a balance of old fashioned common sense and concern within modern facilities equipped with advanced medical technology for effective wellness care and treatment of a broad range of health issues. Our emphasis is on providing comprehensive wellness services to keep pets of all ages and sizes at optimal health. 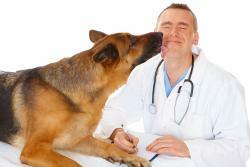 Dr. Kerolos is a second-generation veterinarian. Early in childhood, he gained his passion for pets and veterinary practice by observing his uncle, a veterinarian, providing compassionate animal care. He graduated in 1993 from the veterinary medicine program of Assiut University in Egypt. Assiut's program particularly focuses on the importance of well care and increasing owner awareness of animal health issues. After a veterinary internship in Alabama, Dr. Kerolos established practice in Orange County. Today, he provides assistance to animal rescue groups and shelters along with serving the clients of Trinity Pet Hospital. We also have a special interest in dermatological diseases, internal medicine, small animal care, soft tissue surgery and ultrasound. When a pet needs emergency care or extensive treatment, you may feel anxiety about covering unexpected costs. To help keep your pets healthy and relieve your stress, Trinity Pet Hospital works hard to help keep costs down and also offers Care Credit. Our credit program allows you to apply for a payment plan rather than being overwhelmed by a large bill all at once. All of our team members at Trinity Pet Hospital are trained to aid in healthy pet care as well as providing you with caring customer service. To schedule an appointment or ask questions about our services, please email us or call the pet hospital today at 949-232-1788!